Violence was once predominately accomplished through the use of guns & knives, but as time has progressed attackers have turned to a new method of violence focusing on a new weapon – corrosive acids that have been deployed in many acid attacks that have increasingly occurred throughout the UK. The United Kingdom has one of the highest rates of acid attacks per capita in the world, according to the Acid Survivors Trust International (ASTI). Why has acid become the new weapon of choice among gang members and attackers? Acid use to be a weapon of last resort, however, due to its easy accessibility and the fact that it is hard to monitor has amplified the use of these acids in attacks ten-fold. Recently attacks in the UK have transpired on the streets – particularly to food delivery drivers in an effort to steal their scooters, on the London trains, and even in London nightclubs where frequent acid attacks have happened leading to a dangerous environment to many as the chemicals/acids quickly disperse into the air. What can be done to protect UK civilians from these dangerous attacks & chemicals? Acid attacks in London have increased dramatically in recent years, and lawmakers and the police force are now contemplating methods to make acids that are commonly used as weapons, more difficult to obtain for the general public. Chief Superintendent Simon Laurence of Hackney borough in east London said, “that between 2015 and 2016, acid attacks have increased by 74%”. Between 2014 to 2016, acid attacks have steadily increased each year; 2014 saw 166 acid attacks, 2015 saw 261 acid attacks, and lastly 2016 saw a dramatic jump of 454 acid attacks. Last year also experienced a significant rise of acid attacks and was regarded as the worst year ever for these attacks, with more than 400 incidents reported in the six months to April 2017 alone! The culprit for these steadily increasing acid attack statistics is primarily from gang disputes. The UK acid attackers saw a strong correlation of male victims, unlike many countries that saw about 80% of acid attacks against women. This could be due to the high poverty and lack of opportunities for many young men in London that are led into the world of gang violence. Acid attacks, also known as acid throwing, is a form of violent assault explained as the act of throwing corrosive acid onto somebody’s body with the intention of significantly harming, disfiguring, or killing the intended victim. The most common acid used in these attacks are sulpheric acid, which is found in car batteries. Also, commonly used is nitric and hydrochloric acids. These acids when thrown onto a person’s body will start to melt the flesh, sometimes to the bone, and leave permanent scarring or even physical disfigurement. The overall long-term consequences of these lethal acid attacks can include blindness, permanent scarring of the face or body, and also social, psychological, or economic difficulties. Buying corrosive acids have never been so easy to purchase as they are now. Well-known high street chains and online outlets make it increasingly easy to purchase sulphuric acid as well as other corrosive acids with just a few clicks of your computer mouse. Scary, right? 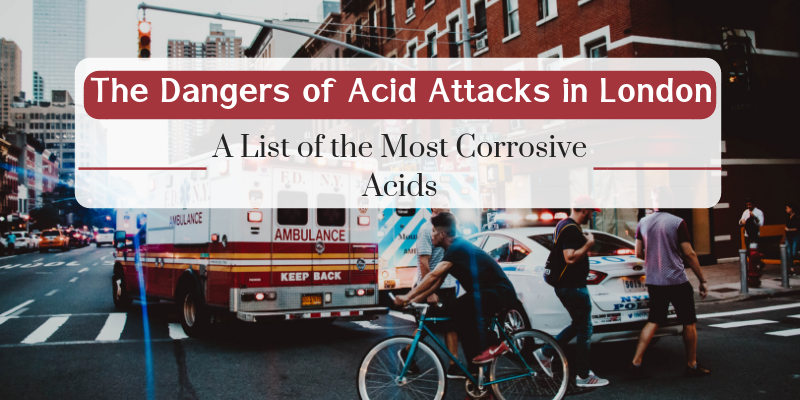 Acid attacks typically utilize different chemistries of corrosive acids and chemicals in these planned attacks. The chemistries involved can include acid family, base family, vapor threats, and toxics. 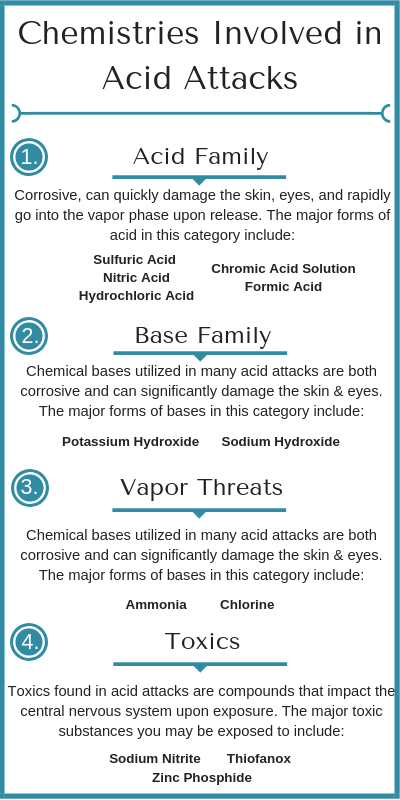 Each of these different chemistries can interact and create different results when exposure occurs, understanding the different acids/chemicals in each category and the best solution to implement to neutralize the release or dispersant of these agents can help to minimize exposure risks to civilians. Sulfuric Acid: This acid is commonly found in common household products such as drain cleaner and fertilizer and is a clear, colorless, and odorless liquid. This dangerous chemical is capable of corroding the skin, paper, metals, and even stone in some cases. If this chemical makes direct contact with your eyes it can cause permanent blindness and if it is internally ingested it can even cause internal burns, irreversible organ damage, and possible death. Nitric Acid: Nitric acid is a colorless or yellow liquid with a caustic odor and extremely corrosive properties. This chemical is used in the manufacturing of a wide variety of products including explosives, ammunition, rocket propellant, inks & dyes, aging pine and maple wood, and commercial cleaning agents. The acid is extremely corrosive, capable of causing severe chemical burns very rapidly. Hydrochloric Acid: Approximately 20 million tons of hydrochloric acid are produced globally every year, and you can even find this acid in your home. This acid is corrosive and if it comes into contact with the skin, eyes, or internal organs the damage can be irreversible or even fatal. Chromic Acid Solution: An acid solution that is identified as a human carcinogen. This acid can affect your breathing and can irritate the nose, throat, and lungs causing coughing, wheezing, and shortness of breath. Formic Acid: Commonly used as a preservative and antibacterial agent in livestock feeds – this acid pesticide is a clear, colorless liquid with a strong odor. When exposure to this acid occurs, you can expect burning of the skin or eyes, as well as respiratory irritation. To effectively combat these corrosive substances, a need for an efficient neutralization agent like FAST-ACT is high. FAST-ACT works by converting the inorganic acids to metal salts and water. Once FAST-ACT is deployed the proprietary technology works to contain and neutralize the acids to a safer pH. Potassium Hydroxide: A chemical base that is commonly found in drain and pipeline cleaners & bleaching agents. This corrosive substance can be damaging to the eyes, the skin, and the respiratory tract. Potassium Hydroxide can be absorbed into the body by inhalation – particularly when acid attacks occur. Sodium Hydroxide: Sodium hydroxide is a chemical found in industrial solvents and cleaners, including drain cleaners and oven cleaners. This chemical is a strongly irritating and corrosive substance that can cause severe burns and permanent damage to any tissues that come into contact with this base. To effectively combat these corrosive substances, a need for an efficient neutralization agent like FAST-ACT is high. FAST-ACT works by suppressing the vapor & containing the liquid with the excess FAST-ACT bringing its pH into a safe range. Ammonia: Ammonia is one of the most commonly produced industrial chemicals in the United States. This chemical is found in many household and industrial-strength cleaning solutions. Ammonia gas is released into the air and quickly disperses due to the fact it is lighter than air. Exposure to high concentrations of ammonia in the air will cause immediate burning of the nose, throat, & respiratory tract. Chlorine: Chlorine is a chemical used in industry and household cleaning products. The substance is among the ten highest volume chemicals made in the United States. Chlorine can enter the body as a result of breathing, swallowing, or skin contact with the substance. The acid is corrosive and can damage cells in the body upon contact. To effectively combat these corrosive substances, a need for an efficient neutralization agent like FAST-ACT is high. FAST-ACT works by interacting with Chlorine to form MgCl, as well as the nitrogen in ammonia react with the metal in the FAST-ACT metal oxides and OH groups. Upon contact with FAST-ACT, chlorine will be knocked down and neutralized and ammonia will be knocked down and contained. Sodium Nitrite: This compound is commonly used in the manufacturing of fertilizers and explosives. Sodium nitrite is an odorless, yellowish white chemical that when exposed can affect the respiratory system, eyes, and skin. High levels of exposure to sodium nitrite can reduce the blood’s ability to transport Oxygen, leading to headaches, dizziness, and a blue color to the skin and lips. Thiofanox: Thiofanox is a colorless solid with a pungent odor, that is classified as a carbamate pesticide. This chemical is widely used in homes, gardens, and agriculture. When exposure to this pesticide occurs headaches, salivation, nausea, vomiting, abdominal pain and diarrhea can plague the exposed individual. Zinc Phosphide: A dark grey solid with an odor similar to that of decaying fish. Zinc phosphide is used as a rat and mice poison that is on the Hazardous Substance List. Chronic health effects that can occur from major exposure to this substance include potential cancer and reproductive hazards, irregular heartbeat, and damage to the liver and kidneys. To effectively combat these corrosive substances, a need for an efficient neutralization agent like FAST-ACT is high. FAST-ACT interacts with the Nitrogen, Phosphorous, or Sulfur of the compounds to break the bond with the large molecule resulting in a byproduct bound to the FAST-ACT material resulting in neutralization. Treating not only an acid attack victim but also the environment in which the acid attack took place is critical to minimize exposure to others from the abrasive & corrosive acids used in these hazardous attacks. The first step to implement when someone has been attacked with acid is to make sure the area where the incident took place is safe and take the necessary actions to ensure the corrosive acids and substances are neutralized. The many different chemical families used in these attacks are problematic for responders because of the various mechanisms needed to address all of the present substances in the environment. First responders would have to test and determine what mechanisms to use to neutralize the substances. 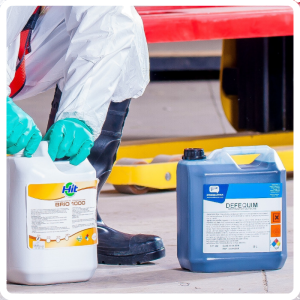 However, a solution like FAST-ACT can address both liquid and vapor threats from the Acid, Base, Vapor, & Toxic categories, including CWAs. Secondly, you will want to treat the victim by dousing the burn with water for at least 20 minutes. Try to gently remove any clothing with the substance on it and call first responders ASAP for treatment. The steady increase of acid attacks in the UK has not gone unnoticed, as plans of recourse are being strategically made in an effort to reduce this growing number of acid attacks. Former Home Secretary Amber Rudd has a plan to ban the sale of corrosive substances to those under the age of 18. 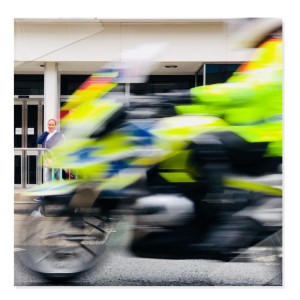 However, being prepared – particularly the police in the UK, as well as other countries – with the necessary solution for acid attack neutralization is vital in helping to reduce the imminent threats present in the environment. What is Your Response Strategy for Unidentified Materials? Are You Prepared for a Refrigerant Leak? Download our chemical app for Apple and Android devices.